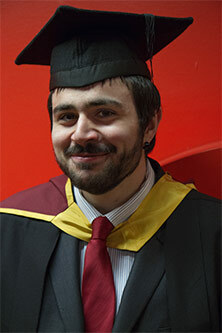 City academics come in for praise from School of Computer Games Technology graduate Orkun Bektas. Orkun Bektas joined over 500 students who graduated from City University London at ceremonies held in the capital on 29th April. "The teaching staff was always available whenever I had any questions and they were really helpful. Dr Greg Slabaugh's guidance was critical to my success in my thesis project." "I decided to do a post-graduate qualification in Computer Games Technology because video games has been my passion and I wanted to pursue a career in the field. I thought getting a MSc degree from a highly regarded university such as City would teach me the skills required in the career path I wanted to take." Now employed at premier games developer, Rockstar Games, Orkun believes that his City degree has been "helpful for both getting the job and providing me with the skills to be an asset to the company." Though he emerged from the course with top honours, Orkun says it wasn't always plain sailing: "Some of my assignments were challenging and involved intense thinking and extensive designing. After I completed the course, Dr Chris Child and Dr Greg Slabaugh invited me to be part of Cancer Research UK's Gamejam. Trying to complete the production of a game in less than 72 hours with complete strangers taught me a lot and was one of the highlights of my time at City."